Finding a healthy snack that also tastes great is easy with the MaxLiving Essential Bar. With a delicious chocolate berry crunch flavor, the Essential Bar is the first and only snack bar available on the market that is suitable for MaxLiving's Advanced Nutrition Plan. Each box contains 10 great tasting Essential Bars. These nutrition bars ship directly from the manufacturer in Tennessee to preserve freshness. These healthy snack bars are made on demand to ensure taste and quality and can be shipped to the U.S., U.S. territories, and Canada. *Manufactured with equipment that processes products containing peanuts. Organic Almond, Organic Yacon Syrup, Organic Raw Hemp Seed, Organic Chia Seed, Organic Flaxseed, Organic Cocoa Butter, Organic Cocoa, Organic Coconut Oil, Organic Raspberry Powder, Organic Maqui Berry, Organic Vanilla Extract, Organic Chocolate Extract, Organic Cranberry. Vitamin A 0%, Vitamin C 2%, Calcium 8%, Iron 10%, Vitamin D 0%, Vitamin E 10%, Vitamin K 0%, Thiamin 15%, Riboflavin 8%, Niacin 2%, Vitamin B6 4%, Folate 4%, Vitamin B12 0%, Pantothenic Acid 0%, Phosphorus 20%, Magnesium 25%, Zinc 8%, Selenium 2%, Manganese 50%. Treat the Essential Bar like fresh produce rather than a dried good. The Essential Bar carries more natural and pure food certifications than any bar in the marketplace. For this reason, it has absolutely no preservatives. Please do not expose these bars to extreme heat or in the direct sunlight for extended periods of time. Freshness is extended when you keep them in a cool location. For maximum extended freshness, refrigerate until needed. 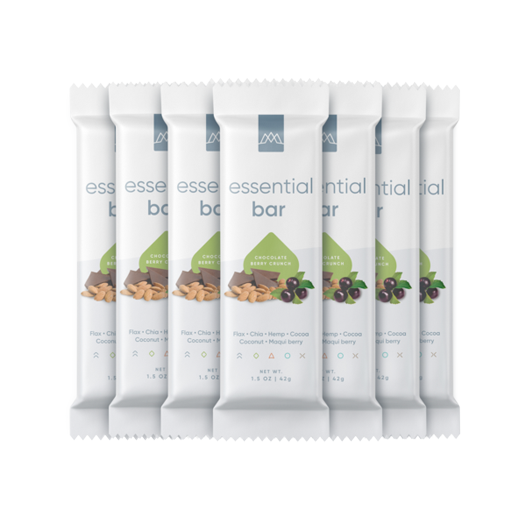 The Essential Bar is the only bar in the market made in strict accordance with MaxLiving's Advanced Nutrition Plan and is one of the highest certified nutrition bars in the US. With only 4 grams of sugar per bar, these healthy snacks are very low on the glycemic index, making them a great option for diabetics. Sweetened with yacon syrup, these nutrition bars also contain maqui berry the highest antioxidant berry in the world. Since this product is made fresh and on demand, please allow up to 5 days for this item to be manufactured and shipped. © Copyright 2015 drserrano.me. All Rights Reserved.